We are thrilled to introduce you to Michelle Luscombe, Centre Manager at O’Briens Montessori Centre in Modbury SA. Michelle has a world of experience having worked across retail, family owned business and over a decade in early childhood education. O’Briens Montessori Centre offers a small and homely setting and a true Montessori education in Adelaide’s north eastern suburb of Modbury. With small classes and a structured Montessori led program, your kids will love spending their time with their teachers and friends. 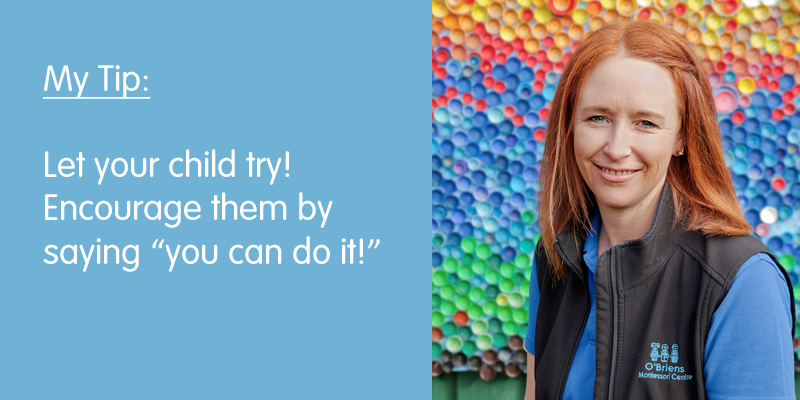 We sat down with Michelle to learn more about her passions personally and for early childhood education. What was your first experience with early childhood education? Whilst I stayed home with both my children in the early years (I loved this season), once my son started school, we found our daughter needed a little more in her day by the age of 3. I was introduced to Montessori when we first visited O’Briens Montessori Centre (I knew nothing about Montessori at that time). My daughter was very comfortable in the environment and was immediately engaged and did not want to leave. She would look forward to Montessori and it very quickly became an important part of her life. A little later when she began school, an opportunity opened up for me to work at the centre. I found that I really enjoyed spending time with the children and started to study in the area of Early Childhood Education. Ten years on and I’m now the centre manager. Over the years I have seen the Montessori method of teaching and the ‘prepared environment’ have such an incredible impact on children. Time and time again I see children growing in confidence, independence and the joy on a child’s face when they achieve and complete a task or activity. Montessori is about equipping the child to succeed on their own. As parents or carers customarily, our maternal instinct is to just do that task for the child in our care. I, myself was also very much like this when my children were young. It can at times hinder their development. “As soon as independence is reached the adult that keeps helping becomes an obstacle”. We often hear … “no I can’t” so a positive word and a demonstration will help. It may take more time. It could be that you are desperately trying to get out the door or get cleaned up. However, allowing your child to do it for themselves brings confidence and independence, in turn a child growing in self-assurance. There are many moments in my day that I enjoy but the best time for me is teaching and talking with the children. Children are surprising and just fabulous fun! When a child has a positive outcome or reaches completion on something that may have been a challenge, the joy from that child is transferable. Having an amazing team here at O’Briens Montessori Centre, in addition to our program and collaboration with families, makes O’Briens a force in the community. I am very proud to be associated with this centre. What is your favourite kids book? The Nick Bland Series – The Very Grumpy Bear, The Very Brave Bear, The Very Itchy Bear. Children of all ages love this series and it can be enjoyed over and over again. What can we usually find you doing on the weekend? My husband and I own two food carts and so most weekends we are busy busy! Prepping and cooking Paella around Adelaide. On the rare weekends we have off, we love to go to the movies with our children and walking in the hills or on the beach. Having been married for 27 years, we have a 15-year-old son and a 13-year-old daughter. As we now have two teenagers at home, life looks a little different, but we are truly enjoying each season with our children. Travel? Yes Please! Anywhere through Europe. Check out O’Briens Montessori Centre for more information, availability and pricing. You can even Book a Tour and meet Michelle and the team.